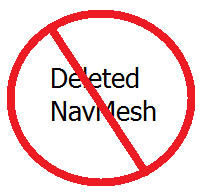 My deleted nav meshes are all in the official master files if I'm not suppose to clean it this way how am I supposed to undelete them at all? There's already very few guides on this as is and the only ones that I've found are only for mods. If I'm understanding you correctly, some Vanilla (Skyrim.esm) navmeshes that were deleted in a DLC (Update, Dawnguard, HearthFires, Dragonborn) have their "deleted" entry being copied into your plugin, essentially creating an ITPO (Identical to Previous Override). If this is the case, open your plugin in xEdit -> Apply Script on your plugin -> Remove ITPOs. Then, load your plugin in the CK and resave to generate the correct NAVI record. If this isn't the case, let me know. Perfectly helpful. Thank you very much! Ooh, this was much more straightforward than the TES5Edit method. That guide required me to override Vanilla navmeshes... How should I do that when there's two mod navmeshes for each vanilla navmesh? Replace one and hope it's the right one? Lol no. This guide is what I needed. Thanks. Hey, seems like a great guide. But i kinda feel dumb. I can't even get to that first step. It only proposes me to load the master files when i launch TES5edit (Skyrim.esm, Update.esm, Dawnguard.esm, Dragonborn.esm, Hearthfire.esm). None of my mods is proposed (I got approximatively 130 mods). I think it's due to my mods not being present in my Data file. But my problem is that for some mods, the authors clearly warned to not put these mods into the Data file. (plus it would create a mess... i think). I don't wanna break anything since i did all the modding years ago and i don't even remember the basics. I also never used TES5edit and CK before. But i'm trying to fix all these CTDs once for all... (Until now i've got one in Whiterun, one near Iverstead when climbing the mountain, and one near the Orphan Rock zone). Do you use Mod Organizer? You need to launch TES5Edit and the CK through Mod Organizer. The mods are now displayed when launching TES5Edit via MO. I definitely learned a couple of things myself. I am a total newbie at using the creation kit and I was able to follow these directions with only slight hiccups (CK is definitely a little buggy to say the least). GamerPoets, I definitely think you should make a video detailing this method. It will really help out people like myself who are still pretty new to modding. This is basically undeleting and disabling navmeshes! My mind is officially blown. Thanks AndrealphusVIII. This was the only set of instructions on how to do this that I could understand after weeks of scouring the web. Pressing 'Z' isnt doing anything. Rest of the guide is clear, but this part, nothing happens. While you have the entire navmesh flood filled, you need to hold "Z" down, not just press it, to be able to drag the navmesh down. (So press and hold down Z first -> press and hold down left Click, whilst keeping Z down as well + move mouse downwards). 1 - Can you consider making a Fight Against the Thalmor Tweaks and Enhancements http://www.nexusmods.com/skyrim/users/5691694/?tb=mods&pUp=1 and fixing the deleted navmeshes from II and IV? I'll take a look at fixing the deleted Navmeshes from Corners of Skyrim and Fight against the Thalmor and maybe making a Tweaks and Enhancements for Fight Against the Thalmor as well. I've already PM'ed both mod authors to ask for permission, but unfortunately they both seem to be retired from modding. So currently I don't have their permission to work on their mods. As soon as they reply and grant my permission, I can start working on them.